I used to be a huge fan of spaghetti squash, even wrote a post on how to prepare here. But as far as a tasty and filling, low-carb pasta substitution, veggie noodles are on a whole new level. They require almost no time investment and have the weight and shape of true noodles. My husband even said they tasted delicious and “substantial.” Substantial! I made them with a hand-held spiral vegetable slicer. There are many different slicer options. 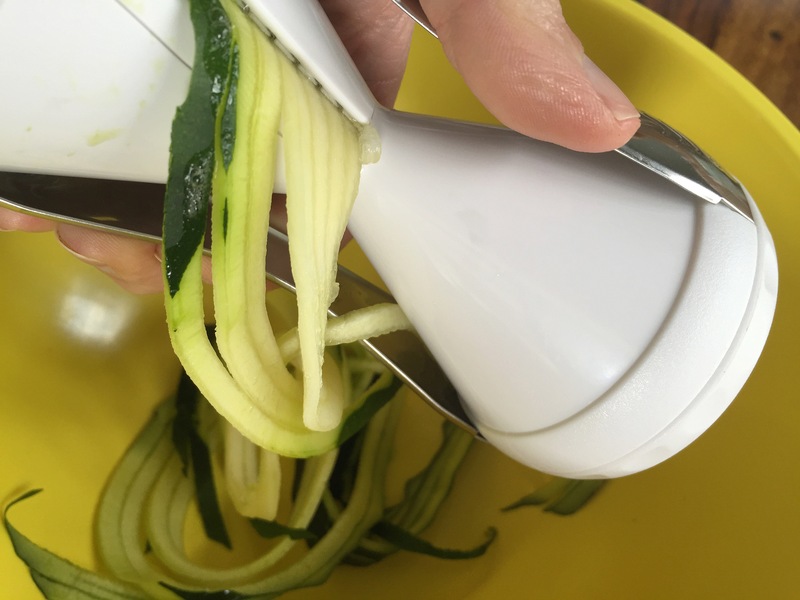 I used the Veggetti brand just to test and see if I liked, but since I’m now obsessed and have made zucchini noodles every few days for the past three weeks my next purchase will be this Spiralizer equip with various interchangeable blades. The Veggetti has two blade options (one on each end) for either spaghetti or fettuccine-sized noodles. 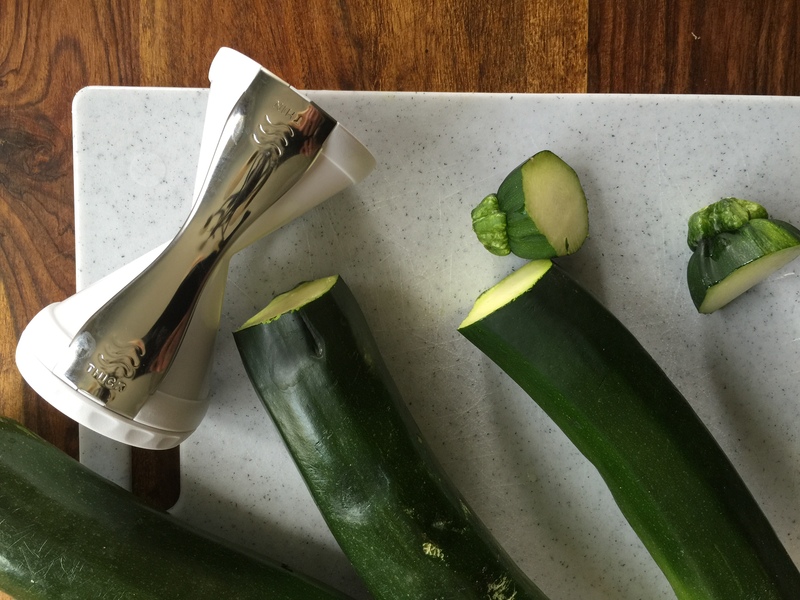 To use, cut the ends off of your zucchini, make sure it is lined up with the blade and twist. Voila! Instant pasta ribbons. 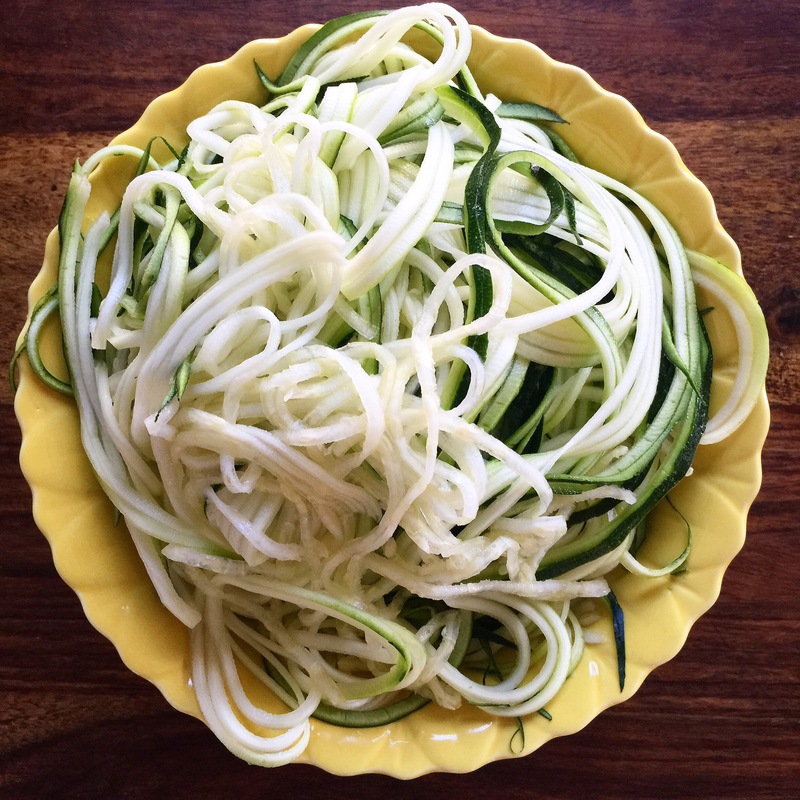 Here is a delicious and beyond easy recipe to get you and your family hooked on vegetable noodles. I’ve made this as both a side item and as a main course topped with grilled chicken or shrimp. 5 Tbs of Good Seasons Garlic & Herb salad dressing. This is my favorite dressing and I put it on everything. It comes in a packet. Mix contents with water, apple cider vinegar and olive oil. You can also sub Garlic Expressions dressing in a pinch. Wash and dry zucchini and cut off ends. 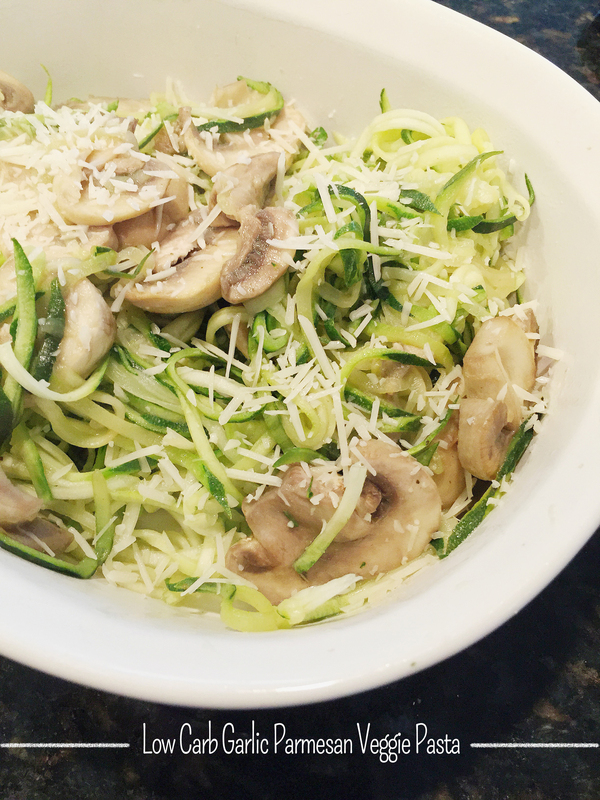 “Spaghetti shred” all zucchini into a bowl. Heat olive oil in a pan on medium high heat for 1-2 minutes, add and saute mushrooms for 5 minutes. Drain excess liquid. Add zucchini noodles, top with garlic & herb dressing and sautee on medium high heat along with mushrooms for 4 minutes. Drain and pat dry. Top with Parmesan cheese, another drizzle of garlic & herb dressing, sea salt & cracked pepper. This looks and sounds delicious, Chelsea! I am definitely going to try this! Thanks Terry! Let me know what you think. Ah! This looks delicious and amazing and healthy! :D!